A mother (not Jewish) tells her four grown children that her departed husband (Jewish) made a final request: He wanted his family to sit shiva, the seven-day period of mourning that follows a Jewish death. During the period, the family receives guests who wish to pay condolences. This is Where I Leave You uses a suburban shiva as a contrivance around which to string a strong comedy cast that’s anchored by Jason Bateman and Tina Fey. If you’ve seen the much-exposed trailer, you’ve got a pretty good idea about the movie’s humor, which tends toward dismaying predictability. And you certainly won’t be surprised to learn that This is Where I Leave You eventually attempts to wring emotion out of the family’s alternately awkward and combative encounters. The movie was directed by Shawn Levy (Date Night and Night at the Museum) from a screenplay by Jonathan Tropper, who adapted his own novel. The story centers on Bateman’s Judd Altman, a pleasant enough fellow who produces a radio talk show. Judd’s life comes apart when he arrives home to find his wife (Abigail Spencer) in bed with his boss (Dax Shepard). We are, of course, talking about an ultimate-bad-day scenario: Almost immediately after Judd’s marriage and job go down the drain, he receives a phone call informing him of his father’s death. Judd, who becomes a kind of sitcom version of Job, heads home where he reunites with his mother (Jane Fonda) and siblings. 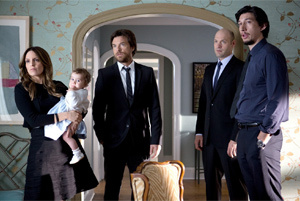 His older brother (Corey Stoll) runs the family’s sporting goods store, and is manfully trying to perform his sexual duty with his wife (Kathryn Hahn). She’s desperate to become pregnant. Judd’s sister Wendy (Fey) has a wavering marriage and two small children, one of whom has a fondness for using his potty in public, something the movie apparently regards as so hilarious, it must be repeated several times. The irresponsible Altman brother (Adam Driver) shows up with an older woman (Connie Britton) in what’s supposed to be his first serious relationship. As the story unfolds, Judd reconnects with Penny (Rose Byrne), a woman who liked him in high school and who looms as a potential love interest. God forbid anyone in a Hollywood movie experience anything resembling lingering dejection and loneliness. Timothy Olyphant turns up sporadically as one of Wendy’s former boyfriends, a guy whose promising future hit the skids when he was brain damaged in an auto accident. Not enough characters? Throw in Ben Schwartz as the local rabbi, a clergyman who the Altman brothers knew and tormented as a kid, and who now arrives to torment an audience. The writing mixes sit-com style cleverness with heartfelt exchanges, creating scenes aimed at Hollywood’s solid double; i.e., a blend of laughs and tears. Apart from the fact that none of the siblings looks as if they’ve sprung from the same gene pool, the movie comes off as a formulaic attempt to be quirky. Neither as painful as the trailer might lead you to believe nor as successful as it surely wanted to be, This is Where I Leave You feels like a movie that wanted to click in a big way, but put far too much effort into trying. It shows.